The deep rooted tree is a phreatophyte. The definition of a phreatophyte is a plant or tree with an extremely long root structure. 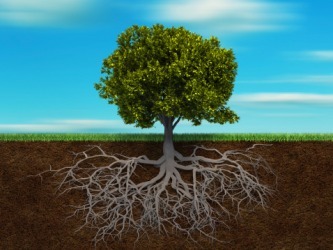 They have learned through evolution how to grow their roots down to the water table, deep below the earth’s surface, where the water from the monsoons and other desert rains can penetrate and keep from evaporating once the heat returns. They are also protected from temperature extremes and from being uprooted by their highly developed and persistent root systems. They can live in standing water or where the water table is very near the surface. An example of a phreatophyte is alfalfa. "phreatophyte." YourDictionary, n.d. Web. 09 April 2019. <https://www.yourdictionary.com/phreatophyte>. A plant, often with deep roots, that is mostly or entirely dependent on water from a permanent ground supply. A deep-rooted plant that obtains water from a permanent ground supply or from the water table, such as many tamarisk species. Phreatophytes are often found in arid environments.